This lesson will provide an introduction on How to implement Network Printing. Examples of how to share printers and connect to shared printers are described. Using 802.11 and Bluetooth standards, hosts can connect to wireless printers. For wireless printers to use Bluetooth, both devices must have Bluetooth capabilities and be paired. These wireless printers have pre-installed wireless NICs that are configured to connect to an access point or a wireless router. Some wireless printers allow for printing from mobile devices. Hardware print servers are devices, not computers, that physically connect to printers that do not have built-in network capabilities. The printer is hardwired to the print server that then shares the printer over the network. Software print servers are computers that have built-in software, making them capable of sharing printers over the network. This is the most common type of print server. To verify that sharing was successful, look for a “hand” under the printer icon in the Printers and Faxes folder. The “hand” indicates is a shared resource. Note: It should be enabled by default. File and print sharing is also turned on by default Windows 7, but it’s a good idea to double check. Create a new port and set the type as Standard TCP/IP Port > click Next. Network printing adds additional configuration steps for the administrator. The main requirement is to share a printer. This printer can be directly attached to a machine or be controlled by a print server. The latter can be implemented in software, such as on a Windows server, or in a hardware device that is attached or installed in a printer. 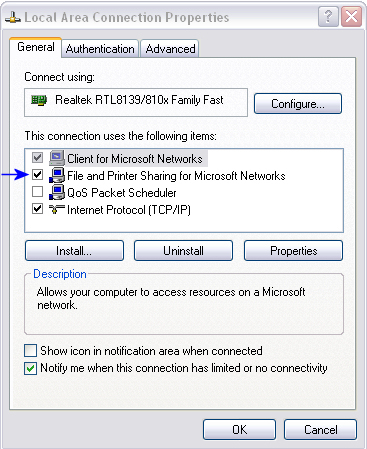 There are specific procedures to share a printer and to connect to a shared printer in all versions of Windows. Additional or new print drivers may be required in order for the printer to function properly.